Reeves Construction Co. will repave the intersection of Jeffersonville and Millerfield roads under a $33,876.75 contract. County Engineer David Fortson said extensive work is planned on Jeffersonville Road, but that’s unlikely to occur for another two or three years. The intersection’s “very rough” pavement needs a temporary fix now, he said. Reeves was the only bidder. What is Wrong with these Traffic Counts? The Counts do Not justify the proposed road plan. The T-SPLOST project description for Millerfield/Jeffersonville Roads is so full of holes it would be laughable were the taxpayers not being asked to pay for the nearly $39 million boondoggle. The 2008 traffic counts in the U.S.129/Gray Highway corridor area show Shurling Drive down 31% and Gray Highway down an average of 7%. Routing traffic between Milledgeville and Macon to a Millerfield/Jeffersonville alternate route is disingenuous. Inbound traffic using the alternate would simply join-up later at 2nd St. possibly exacerbating the traffic backup problem as inbound U.S. 80 commuters join the stream. The Fall Line Freeway comment is way off-base. Jeffersonville is a northern loop off the FLF and U.S. 80. Staying on U.S. 80 is the preferred route. Southbound Gray and Milledgeville traffic would not use Millerfield/Jeffersonville to get to the FLF, other shorter more convenient routes are available. Reducing the incidence of crashes along this roadway segment, corridor, and/or intersection is an iffy proposition. Wider roads mean higher speeds bringing an old axiom into play: Speed kills. The only way this politically-motivated project will go away is to vote "NO" on July 31st, referendum day. Please find the attached court reporter comments from the Public Hearing on January 5th. Should you require anything else, please let me know. Thank you. Here is the link to the public website. Under the drop down box for County and Project, you will need to select Bibb County and Jeffersonville Road Widening. If you have any other questions, please let me know. GaDOT responds to citizen's criticism of the project. Residents at Thursday night’s public meeting about Jeffersonville Road seemed mostly worried about how long it would take to widen the road from two lanes to five. Construction is expected to wrap up in 2017. The meeting at Mount Moriah Missionary Baptist Church was busy, with about 80 people arriving in the first half of the three-hour open house. Roadwork also would reach up Millerfield Road toward the church, but most of the work will be on Jeffersonville Road itself. The project includes adding sidewalks and a turn lane while doubling the number of travel lanes. Planning for the $24.6 million Jeffersonville Road project was launched with money from Bibb County’s 1994 special purpose local option sales tax, but delays set in. An environmental study took about six tries to complete, said Van Etheridge, program manager for the Macon-Bibb County Road Improvement Program, who said people want the road widened soon. Each part of the widening project would place a sidewalk or multi-purpose path on each side of Jeffersonville and Millerfield roads. The roads now are mostly two lanes with no sidewalks. Roberts said she didn’t know her house was slated for demolition until she arrived at Thursday’s meeting. In all, some 12 houses and two businesses are expected to be demolished, most of them close to Emery Highway and the entrance to the Ocmulgee National Monument. 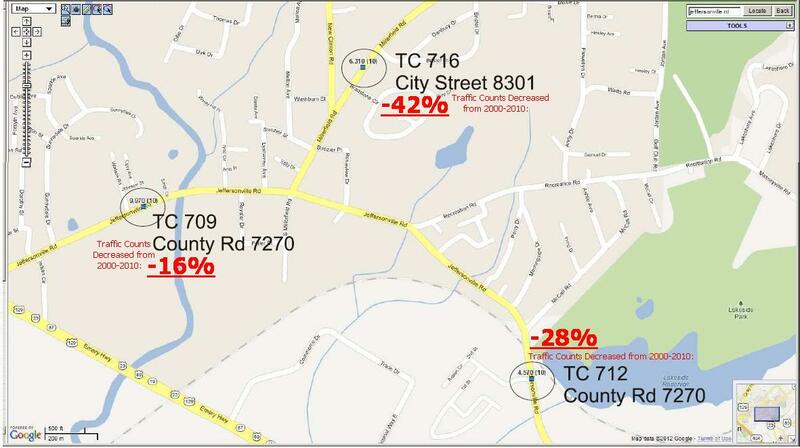 Officials plan to buy right-of-way beginning this summer, and could buy everything they need for a wider road by mid-2014. Construction likely would begin in 2015. Roberts said the upgrades are needed. 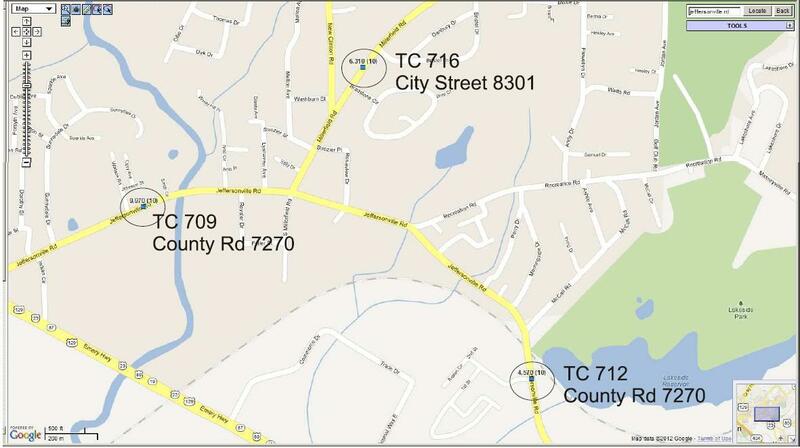 We did not know about the January 5th GDOT meeting related to five-laning Jeffersonville Rd. and portions of Millerfield until several days afterwards. At that point, we went to the GDOT office on Riverside Dr. and were allowed to see one large drawing of the project. After considering the design, we attempted to find a website where we could submit comments, but could not find one. We finally obtained your e:mail addresses from someone who did attend the meeting. I hope that you will be kind enough to forward our comments to the appropriate party for inclusion. COMMENTS TO PROJECT: Jeffersonville Road/Millerfield Road project #STP00-3223-00(004)/BRMLB-3223-00(006), STP00-3223---(002), STP00-3223-00(005), etc. As owners of two houses at 2328 Millerfield Rd., within the project area, and another at 2385 Millerfield Rd. near the projectâ€™s terminus, we frequently travel these two-lane residential roads. We have never seen them congested, by any rational definition of that word. Occasionally, we must slow down or stop for another driver to make a turn or for pedestrians walking along/crossing the road, bicycle riders, children in the street, or someone on a motorized wheelchair traveling along/crossing the roadway. Because such activities are everyday occurrences, the thought of a five-lane expressway through this residential area is terrifying to say the least – not to mention, the excessive noise a thoroughfare of this type would inflict upon the primarily-minority families living in homes that are already situated close to the roads. Additionally, we daily travelled the portion of this route between Highway 49 and Emery Highway to and from work for 30 years before we retired. 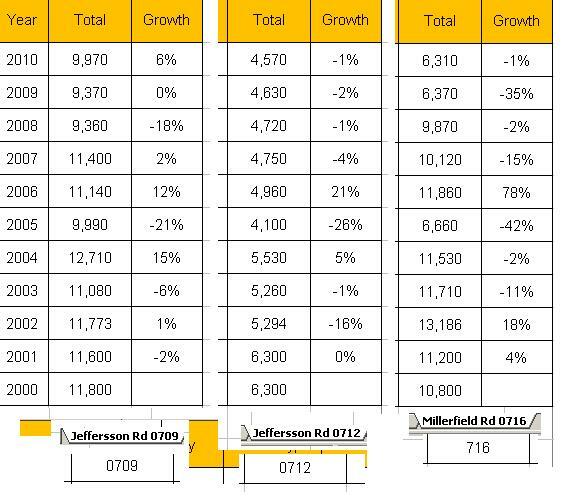 We can tell you, from long experience, that traffic on Millerfield and Jeffersonville Rds has slowly dwindled over the years. Also, four-lane-divided Emery Highway runs almost parallel to Jeffersonville Rd. It is only a mile or so farther to travel Emery Highway and reach the same point where Jeffersonville Rd. joins Highway 57. For these reasons, we believe the project is exceedingly over-designed and will cause a great amount of harm to this residential area at an unnecessary, ridiculously high cost to already-overburdened taxpayers. All that is needed for convenience and safety in this project area are turn lanes at several locations on Jeffersonville Road; sidewalks where they are lacking (and, perhaps, bike lanes); modernization of the bridge over Walnut Creek; and repaving of Jeffersonville Rd. Millerfield Rd. was widened and repave just a few years ago. Any further public transportation funds should be earmarked for much-needed road and bridge repairs-repaving elsewhere. Lee Martin and I enjoyed speaking with you last Thursday evening at the public hearing for the Jeffersonville Road project. We informed you about the history of traffic projection abuse in our MPO. The MATS-CAC (Citizens Advisory Committee to the Macon Area Transportation Study) has repeatedly expressed our deep concerns about local "traffic projections" being arbitrary, capricious and inaccurate. These inaccurate projections are used as the principal justification for "supersizing" various road projects in our MPO. Besides the initial waste of taxpayers money, the long term effects of a too-large road facility are the safety problems from induced speeding and the dehumanizing effects of louder road noise pollution from faster traffic thru historical neighborhoods. The Jeffersonville Road expansion project will place 57 homes in non-attainment for noise pollution. Each of these 57 homes along Jeffersonville should be offered a full buy-out of the property if the road plans are to proceed. This website documents the unacceptable inaccuracy of traffic projections used by our MPO. All the inaccurate projections were done by the (M-A) Moreland-Altobelli contractor(s) who are also the project managers for the Jeffersonville Rd project. It is not acceptable for M-A to continue to profit off the taxpayers by dumping ridiculous traffic projection assumptions on our MPO. The current Jeffersonville ADT counts are at 10,000. This count has been flat for over 5 years. GDOT guidelines instruct that traffic projections must be most heavily weighted to the historical trend of the past 5 years. This trend has been flat. It is absurd for M-A to project the traffic to increase to over 14,000 and 17,000 for this road given the past 5 years of flat counts. M-A projections have proven miserably inaccurate for the Houston Road project and for the Forest Hill Road projects mentioned in the website referenced above. Thank-you for your consideration of this situation. Please involve the MATS-CAC in any discussions at GDOT about the accusations in this email and in the website. Please inform us of any official discussions about these traffic projections if we are not in attendance at any meeting where this issue is discussed. We have a right to support our position and to refute any inaccuracies promulgated by self-serving M-A propositions. Please add this letter to the official comments for the Jeffersonville project. Even if the traffic count was at 17,000, a two lane facility with turn lanes where needed could serve better than a number of roads in Atlanta where 2 lanes carry well over 20,000. A single lane Roundabout at Millerfield would reduce idling, delays, noise and air pollution, and reduce accident rates and maintenance expenses. Single lane Roundabouts can easily handle 25,000 ADT. The Bike Path must continue on to the Indian Mounds to have continuity with Heritage Trail there which then connects towards businesses and other destinations in town. Biking is not just recreational, but it is an important transportation option for those without cars who want a far more efficient option than walking. In yesterday’s mail was the Georgia DOT’s 11-page response to 84 comments received from citizens concerned about the Sardis Church Road extension project. None of the comments received a favorable answer, and none of the 22 homes and 3 businesses scheduled for demolition will be spared. But, what really bugs me is this from the report: “The State Historic Preservation Officer considers the Hudson farmstead eligible for listing on the National Register of Historic Places. The historic resource survey was completed in 1999. Meanwhile, preservation of the “historic farmstead” will require the construction of a non-traditional interstate interchange and the rerouting of Nowell Road—probably at additional cost—and the destruction of seven homes. Just as it did with the Forest Hill Road project, The Telegraph’s editorial board must weigh-in on the use of the NRHP as a means to a commercial end. This is a bigger issue than roundabouts and drainage. Biking is a real transportation option in our sister Fall Line City -- Columbus, GA . The Jeffersonville Road Project should have connectivity with the bike trail through Ocmulgee National Monument that connects to downtown. It is a big mistake to re-design this road with no biking connectivity to downtown. The bike lane is missing between Millerfield Rd and Emery Hwy. Nutz. It is not too late to modify the design. Let's do the right thing for Macon's People this time instead of serving the road profiteers. Bruce Sellers hasn’t bought gas in about 18 years. He gets to work every day on a bicycle. “It’s easier than you think. You just have to work at it,” said Sellers, who works as a shop manager at The Bike Shop on Miller Road. Rain or shine, Sellers bikes 6.2 miles from midtown along Airport Thruway to the shop each morning. Besides saving on gas, pedaling to work has other benefits. Sellers said places like Portland, Ore., or even parts of downtown Atlanta are more sympathetic to bike commuters, but Columbus is coming along. With accessibility of the RiverWalk and the Columbus Fall Line Trace, he’s seen more baby boomers come into the shop, looking for bikes. Pat McHenry, associate dean of the College of Letters and Sciences at Columbus State University, said he finds midtown, downtown and parts of south Columbus fairly accessible on a bike. Neighborhoods with roads that connect to places but don’t have a lot of heavy traffic make easy routes for commuting cyclists. McHenry bikes two miles through midtown’s neighborhood streets every day to get to Columbus State University. “But north Columbus is a wasteland,” he said. “There’s no way to bicycle out there.” The north of town has a lot of subdivisions that don’t connect and end in cul-de-sacs, he said, and some have one exit and entrance onto busy and wide main roads. The Columbus Fall Line Trace could be an asset to bike commuters, McHenry said, but the last links between the trail and nearby businesses have to be made. “Don’t use the metaphor of a park, but the metaphor of a road,” he said. “Connect it to destinations.” Signs and bicycle stencils on the road could help, he said. On dry mornings, Eddie LeGallais leaves his Jeep at home. His vehicle of choice for his morning commute is a Kona Ute, a bicycle with a long back-end, perfect for running errands and hauling. “It’s basically the pick-up truck of bicycles,” said LeGallais, who works as a broker services manager at Aflac. His commute from his Windsor Park subdivision to the Paul S. Amos campus off Corporate Ridge Parkway in East Columbus is about seven miles. He is on his bike early, at around 5:30 a.m., to avoid heavy traffic. “The biggest challenge is traffic,” he said. “The motorists on my route are very courteous.” LeGallais said his big bike and a reflective vest he wears while riding also make him noticeable to drivers. LeGallais said Aflac has been supportive of his choice to bike to work, allowing him to adjust his schedule, do some meetings via conference calls and giving him access to employee locker rooms and showers. On mornings when he doesn’t ride to work, LeGallais does a couple laps around his neighborhood to stay fit. He also uses his bike to run errands -- once, he rode to Sears for a car battery. Biking, he said, makes Saturday trips for groceries go smoother. © 2012 Ledger-Enquirer and wire service sources. All Rights Reserved.